Twenty-five (25) of the twenty-six (26) letters of the alphabet are represented in this Series with “FOUR” (4) letter words with Scripture from God’s Word to give us good “words” to focus upon. ABLE | Holding fast the faithful word as he hath been taught, that he may be able by sound doctrine both to exhort and to convince the gainsayers. BODY | (For we walk by faith, not by sight:) We are confident, I say, and willing rather to be absent from the body, and to be present with the Lord. Wherefore we labour, that, whether present or absent, we may be accepted of him. CALL | I will call on the LORD, who is worthy to be praised: so shall I be saved from mine enemies. DRAW | And I, if I be lifted up from the earth, will draw all men unto me. EYES | And God shall wipe away all tears from their eyes; and there shall be no more death, neither sorrow, nor crying, neither shall there be any more pain: for the former things are passed away. FACE | Glory ye in his holy name: let the heart of them rejoice that seek the LORD. Seek the LORD and his strength, seek his face continually. 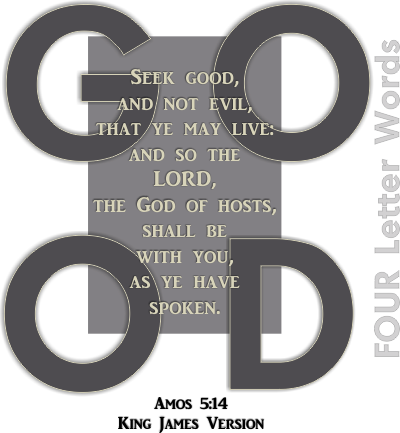 GOOD | Seek good, and not evil, that ye may live: and so the LORD, the God of hosts, shall be with you, as ye have spoken. HOPE | Be of good courage, and he shall strengthen your heart, all ye that hope in the LORD. IRON | Iron sharpeneth iron; so a man sharpeneth the countenance of his friend. JUST | He is the Rock, his work is perfect: for all his ways are judgment: a God of truth and without iniquity, just and right is he. KIND | But love ye your enemies, and do good, and lend, hoping for nothing again; and your reward shall be great, and ye shall be the children of the Highest: for he is kind unto the unthankful and to the evil. Be ye therefore merciful, as your Father also is merciful. LOVE | I love them that love me; and those that seek me early shall find me. MUCH | For unto whomsoever much is given, of him shall be much required: and to whom men have committed much, of him they will ask the more. NEED | Ye shall not need to fight in this battle: set yourselves, stand ye still, and see the salvation of the LORD with you, O Judah and Jerusalem: fear not, nor be dismayed; to morrow go out against them: for the LORD will be with you. OBEY | And the apostles said unto the Lord, Increase our faith. And the Lord said, If ye had faith as a grain of mustard seed, ye might say unto this sycamine tree, Be thou plucked up by the root, and be thou planted in the sea; and it should obey you. PATH | NUN. Thy word is a lamp unto my feet, and a light unto my path. I have sworn, and I will perform it, that I will keep thy righteous judgments. I am afflicted very much: quicken me, O LORD, according unto thy word. QUIT | Watch ye, stand fast in the faith, quit you like men, be strong. Let all your things be done with charity. ROSE | Now if Christ be preached that he rose from the dead, how say some among you that there is no resurrection of the dead? But if there be no resurrection of the dead, then is Christ not risen: And if Christ be not risen, then is our preaching vain, and your faith is also vain. SONG | And he hath put a new song in my mouth, even praise unto our God: many shall see it, and fear, and shall trust in the LORD. Blessed is that man that maketh the LORD his trust, and respecteth not the proud, nor such as turn aside to lies. TURN | Who is a God like unto thee, that pardoneth iniquity, and passeth by the transgression of the remnant of his heritage? he retaineth not his anger for ever, because he delighteth in mercy. He will turn again, he will have compassion upon us; he will subdue our iniquities; and thou wilt cast all their sins into the depths of the sea. UPON | Who is among you that feareth the LORD, that obeyeth the voice of his servant, that walketh in darkness, and hath no light? let him trust in the name of the LORD, and stay upon his God. VOWS | He shall abide before God for ever: O prepare mercy and truth, which may preserve him. So will I sing praise unto thy name for ever, that I may daily perform my vows. WOOL | Come now, and let us reason together, saith the LORD: though your sins be as scarlet, they shall be as white as snow; though they be red like crimson, they shall be as wool. YOKE | Take my yoke upon you, and learn of me; for I am meek and lowly in heart: and ye shall find rest unto your souls. For my yoke is easy, and my burden is light. ZEAL | And his disciples remembered that it was written, The zeal of thine house hath eaten me up. Jesus answered and said unto them, Destroy this temple, and in three days I will raise it up.